When conducting a survey with a closed group of participants (e.g. employee survey) one sometimes have to make sure that only authorised people are able to participate. Additionally, those people should not be able to answer the questionnaire more than once. Basically, there are two ways to achieve that: Via direct mass mailing via eSurveyCreator.com and/or via the distribution of TANs (both options can be combined as well). This article addresses the latter option. 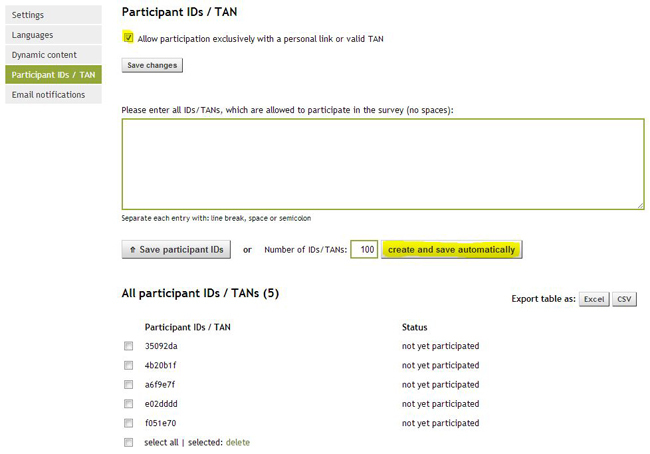 In “Settings > Participant IDs / TAN” you can define that one can only participate in the survey entering a valid TAN. You can either enter all IDs/TANs manually or you can let them be generated automatically. All TANs can be exported as an Excel-/CSV-file (e.g. for the further distribution to all employees). Using this option, every participant will have to enter their own valid TAN in order to being able to participate in the survey. By default, using a TAN, one can only participate once. You can however change this in the settings of your survey to accept multiple participations. If a respondent interrupts his/her participation, he/she will be able to continue afterwards at the same point he/she left the survey by using the same TAN again. Previous Previous post: Can a survey be conducted anonymously?